Hershey Bar Pie – What a treat! This Hershey Bar Pie is a favorite at our house. I make it for the first day of school. I make it for the last day of school and lots of other times in between. I made it for Easter this year. It’s a recipe I got from a colleague. There really couldn’t be an easier pie to make. The recipe doesn’t call for decorating it with the whipped cream but I thought it needed something extra. There are a few things to note, the first being, don’t buy store brand marshmallows. Use only the Jet Puffed brand. The others, for some reason, do not melt as well as the brand. By regular size Hershey bars, I mean the size like you buy in the supermarket checkout aisle. Don’t rush the cooling process. I’ve made this pie the day before serving it as well as the morning of the day I want to serve it. I garnished the top of the whipped cream with Hershey chocolate eggs for Easter. You could easily use a Hershey Kiss for other times of the year. The Hershey website offers a version of this pie but it is different and probably not as chocoaltey since it uses only 1 candy bar. I’ll stick with this one! It’s a keeper! In medium saucepan over low heat, combine marshmallows in milk and slowly melt, stirring often. Add broken up Hershey bars and stir until smooth. Remove from heat and set aside to cool 15 minutes. In separate bowl, whip cream until very stiff; fold into cooled chocolate until well combined. Pour pie filling into prepared graham cracker crust and chill several hours until firm. 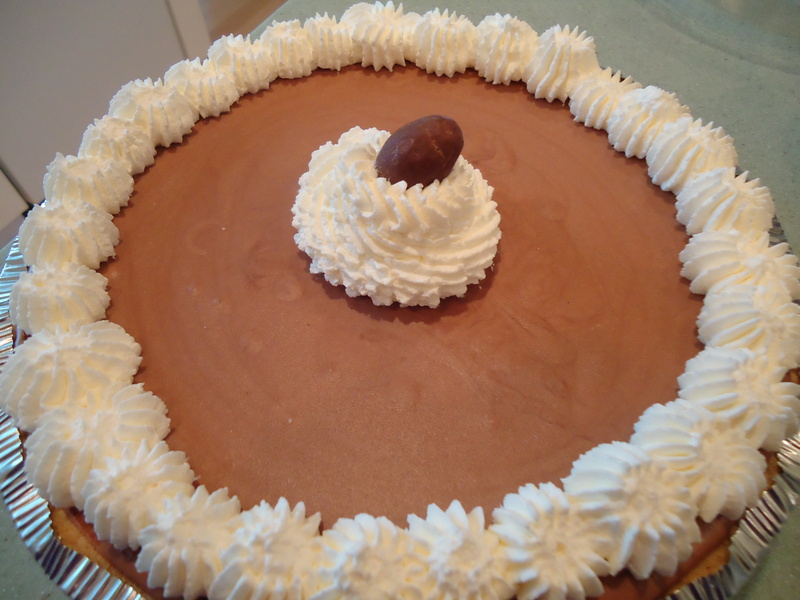 This entry was posted in Company Worthy, Easter, Entertaining, Holidays, Kid's Favorites, Pies. Bookmark the permalink. 4 Responses to Hershey Bar Pie – What a treat! Okay I used to makes this in the 90’s and LOVE it. I lost the recipe and have been looking for it . I would add Carmel to the bottom of the pie and use the Hershey with almonds and it’s to die for. I originally found the recipe on the cardboard that came off the Cool Whip tops and even caught myself looking under them again to find this. 🙂 Thank you for posting this! So glad you found it, Diana! It’s a family favorite of ours! I love the caramel idea!